Beloved as spirited guardians who watch over those we love, angels are enduring symbols of faith, protection and hope. So share the love and warmth of your special day with these heavenly mementos! 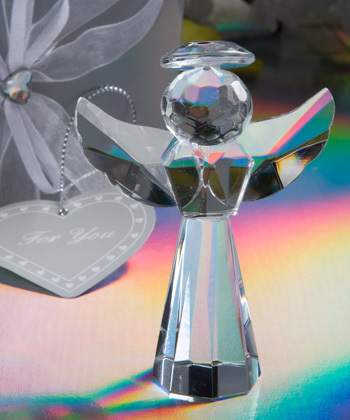 Each measures 3" x 2 1/8" and is made of brilliant multi faceted crystal in the shape of a beautiful angel with outstretched wings and a glistening halo. A joyous choice as holiday wedding favors, for all religious occasion, and for so much more, these crystal angel favors make for a stunning presentation surrounded by white satin inside a Choice Crystal signature silver box decorated with white hearts, wrapped with an organza and satin bow with a crystal heart accent on top and an attached matching heart shaped "For You" tag.